If you've been around railroads lately, you may have noticed the long trains pulling ominous-looking black tanker cars. Odds are, that's an oil train and there are way more on America's rail lines than there used to be. In fact, the volume of crude oil shipped by rail in the United States grew more than 50-fold between 2008 and 2014. Current trends point to even more oil-by-rail transport throughout the United States and Canada in the coming years. Oil trains are a threat to public safety, clean water and sensitive species — and they're as sure a path to climate disaster as oil pipelines, fracking and offshore drilling. Despite a recent series of catastrophic derailments, oil trains continue to roll out of the northern plains and western Canada, laden with cargoes dangerous to our personal, community and environmental health. Only public outcry is beginning to compel greater governmental attention to the threat of oil trains and vastly greater amounts of crude oil being moved around our country. The Center recognizes the dangers of these “bomb trains” and we're fighting to stop them — whether it's opposing expansion of oil traffic in California or pushing the Obama administration for sweeping reforms that — in the absence of an outright ban — will at least begin to make them safer. The Center's work against oil trains includes an early May 2015 lawsuit against the Obama administration, filed with allies, over weak tank-car standards set by the U.S Department of Transportation in its final tank car safety rule. The standards fail to protect people and communities in no fewer than seven key ways. In fall 2014 we and allies submitted formal comments calling for an immediate ban on puncture-prone tank cars involved in several explosive accidents. Also in 2014 the Center for Biological Diversity and Riverkeeper filed a national petition to the feds to significantly reducing the risk of oil train derailments by limiting the length and weight of trains hauling oil and other hazardous liquids, as well as a petition to require oil shippers to have comprehensive oil spill response plans. 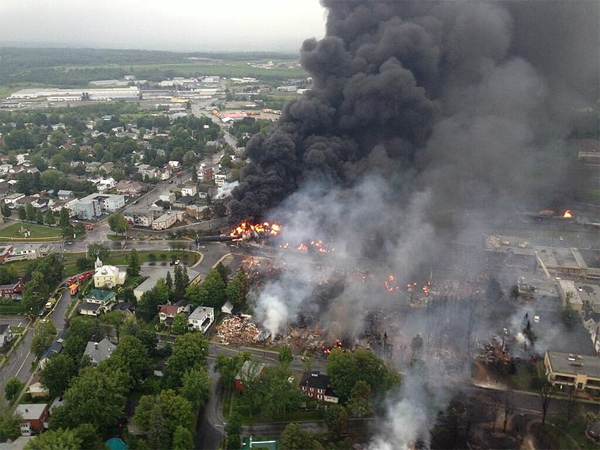 Aerial photo depicting the crash and explosion of an oil train in the town of Lac-Mégantic in Quebec, Canada, in July 2013. The crash of this 72-tanker train, among the worst train accidents in North American history, killed 47 people and spilled roughly 1.6 million gallons of crude oil, some of which reached a lake serving as a focal point of tourism. Following this derailment, similarly explosive oil train crashes occurred in Alabama, North Dakota and New Brunswick. Photo courtesy Wikimedia/Surete du Quebec. Our focus on oil trains began in the Northeast; in January 2014 we called on Congress for a moratorium on rail transport of crude oil in that region, at least until safety and environmental concerns are effectively addressed, and we filed a notice of intent to sue the federal government over its inadequate oil-spill response plan for the Hudson River and New York Bay. We're part of a coalition of groups fighting the expansion of oil transportation along the Hudson. We've already seen several victories against the extreme dangers of oil trains. The U.S. Coast Guard and EPA agreed to analyze the risks to endangered species of oil spill response on the Hudson River and in the Pacific Northwest, in light of the recent dramatic rise in crude oil transportation by rail and barge. In response to the recent spate of fiery derailments, in March 2015 several Democratic senators proposed a bill that would remove the most dangerous tank cars from service, increase track inspections, and help to ensure that first responders have the equipment needed to respond to derailments. And California is being forced to clean up its act: In May 2015 the U.S. Environmental Protection Agency cited the Bakersfield Crude Terminal for 10 violations of the Clean Air Act — declaring the facility a major air pollution source that should have been subjected to rigorous environmental review. At the same time, we've helped build a statewide organizing network and worked with citizens and officials all along the rail route to get 17 cities and counties and 7 school boards to write letters against the proposed Phillips 66 oil train offloading facility in San Luis Obispo County. San Leandro was the latest city passing a resolution urging the San Luis Obispo County Board of Supervisors to deny the project permit. Here's one measure of how dramatic the increase in oil train traffic, and dangerous spills, has become: The amount of crude oil spilled from trains in 2013 was equal to all the crude oil spilled from rail transport in the previous 40 years. One fiery train wreck at Lac-Mégantic, Quebec, in July 2013, killed 47 people and burned up a large proportion of the small town's business district. In 2015 alone, five oil trains have already derailed and exploded — in Fayette County, W.V. ; in northwest Illinois near the Mississippi River; two near Gogama, Ontario; and in the small North Dakota town of Heimdal. Several of these resulted in fires that burned out of control for days. Oil trains have been appearing with ever-greater frequency on tracks and at rail terminals all around the country, usually without public notification, public involvement or even government review. They most often go right through the centers of towns and cities, communities as big as Albany, Minneapolis and Seattle. They also parallel important waterways and other sources of drinking water, such as Lake Champlain and the Hudson and Columbia rivers. They supply East and West coast refineries, and after they reach their coastal destinations, the crude they carry may then be loaded on barges or tanker vessels — endangering estuaries, bays and other coastal environments. So far the majority of oil traveling by rail is called "Bakken crude," from the fracked shale fields of North Dakota and Montana. However, tar sands oil from Alberta, Canada, is also being transported on trains with increasing frequency. Bakken oil is "light" crude, and extremely volatile, making it more flammable and prone to explosion than traditional crude. This fact has only come become public in the wake of a series of explosive derailments.